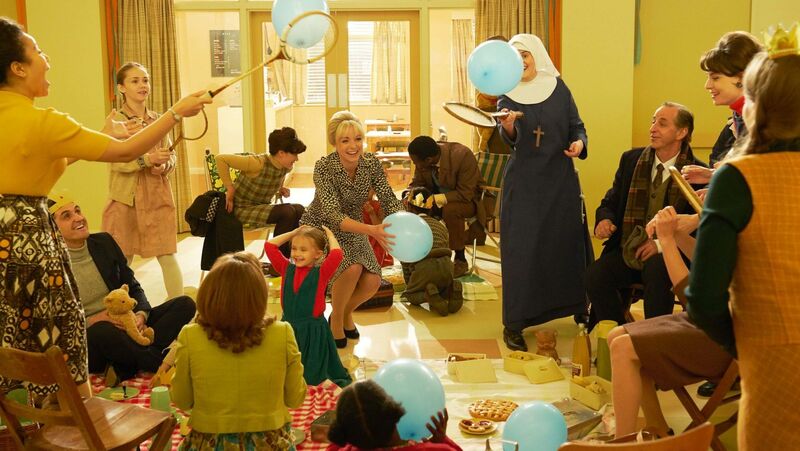 Call the Midwife’s Season 8 premiere welcomes 1964, four new babies – and another heir in Queen Elizabeth’s royal family – plus two new nuns who cause the average age of sisters at Nonnatus House to plummet. The first episode also takes a hard look at an issue which will be a recurring one this season: abortion, which was illegal in the United Kingdom until the Abortion Act of 1967. 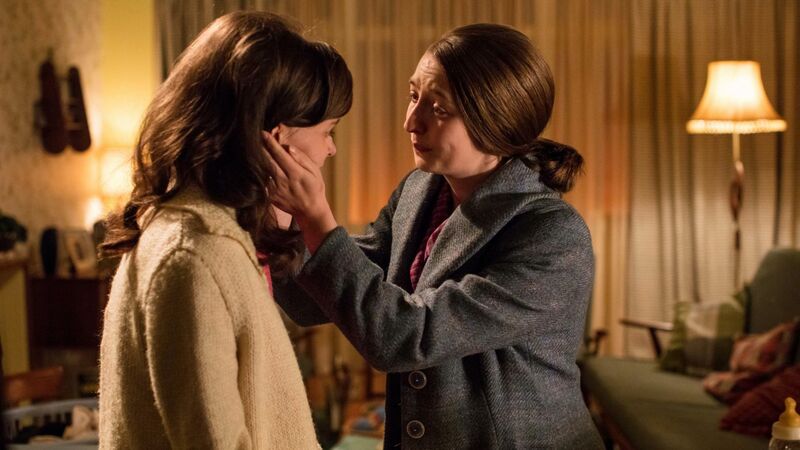 Frances and Hilda, sisters of the cloth introduced in the 2018 Holiday Special, leave the Mother House far south of London to become Poplar residents in Call the Midwife Season 8. Saucer-eyed Sister Frances (Ella Bruccoleri) is young, clumsy and eager to please. As the novice gets ready for the big religious ceremony when she’ll commit to a life of service, she giggles and blushes at the sight of her symbolic white wedding dress being ironed by Sister Hilda (Fenella Woolgar, Home Fires – Masterpiece). “It’s scarcely the land of milk and honey, and if it were, we should not be called to work there!” is how Mother Mildred sums up France’s future home. Don’t worry, Frances! Jump-to-it Sister Hilda will be joining Nonnatus House, too. Hilda is an experienced midwife who served in the Women’s Auxiliary Air Force in World War II before becoming a nun. Also new is the receptionist at Dr. Turner’s surgery: Miss Higgins (Georgie Glen). She appears prim and proper, but she blasts patient confidentiality full of holes with nearly every remark in the waiting room. Shelagh Turner (Laura Main), the former nun who helps her husband Dr. Turner (Stephen McGann) run his practice, does her best to reign in Miss Higgins’ commentary. 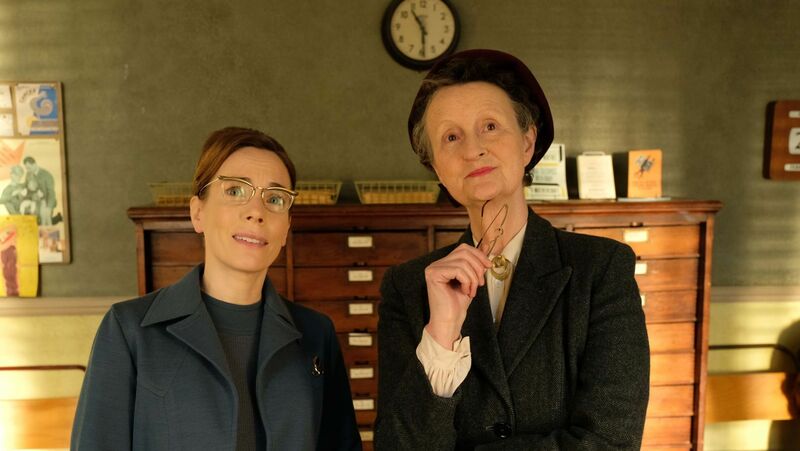 Shelagh Turner (LAURA MAIN), and the new receptionist Miss Higgins (GEORGIE GLEN). The women of Call the Midwife have quite a way with words, sometimes upending what we expect of British propriety. Elsewhere, shopkeeper Violet Buckle (Annabelle Apsion) is running a betting pool on whether the country will welcome a new prince or princess. Miss Higgins has pink and blue ribbons handy to adorn the portrait of Queen Elizabeth she has hung above her desk. Sister Monica Joan (Judy Parfitt) learns that the old medical kit bags will be replaced and discarded. 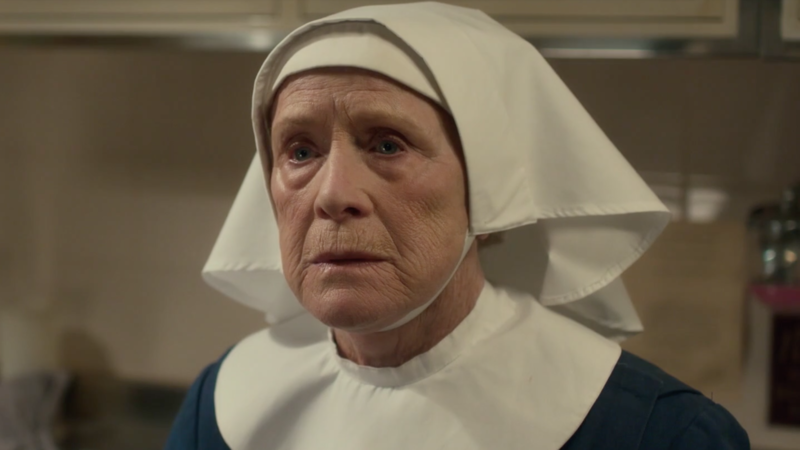 Sister Monica Joan (Judy Parfitt) is Britain’s first midwife and the series’ wellspring of eloquence, nimbly articulating phrases that could be mistaken for lines from Shakespeare. But the nonagenarian also suffers from confusion, and as a medical professional, she’s noncompliant when it comes to looking after her own ailing health. She goes into a panic when she learns the midwives’ decades-old leather medical bags have not only been replaced, but will be burned as waste by Fred Buckle (Cliff Parisi, EastEnders). One bag was hers, which she passed down to another midwife. The bag represents her trailblazing life’s work. Whether or not it’s her exact bag, Monica Joan snatches one from Fred’s pile and goes missing. East End native Valerie Dyer (Jennifer Kirby) and Jamaican immigrant Lucille Anderson (Leonie Elliott) set off into the East End’s streets in search of her that night, carrying flashlights. As resident of New York City in 2019, it would never occur to me to use a flashlight at night. Was the hard-hit East End still recovering from the daily bombings of the Blitz, which by 1941 had left a third of London’s streets a pile of rubble? I don’t know what nighttime visibility was like in London the 1960s, but I did find this hobbyist’s exhaustive site on the history of the U.K.’s street lighting. Valerie finds the bewildered sister at the ruins of the Elfrida Hospital for Mothers & Babies. “The baby we all await is on its way. A crown will be of no comfort where she labors, but a midwife might,” Monica Joan pleads as she waits in vain to be let in “to assist” in the birth of the Queen’s baby. To both acknowledge and dissuade Monica Joan, Val reminds her of the excellent job she did when attending Val’s own birth. But she notes Monica Joan’s cold shouldn’t be passed on to the Queen. With that, she convinces Monica Joan to come home. Sgt. 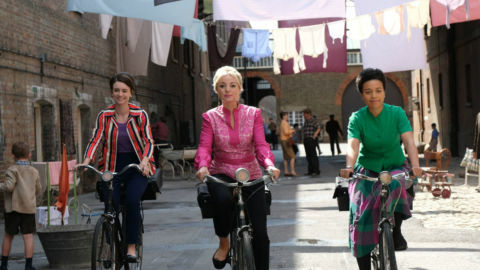 Woolf (Trevor Cooper) drives the midwives back to Nonnatus House and assures Monica Joan that he’ll watch over her bag. Sister Julienne (Jenny Agutter) asks a reluctant Nurse Crane to invite the sergeant to the kitchen. He angles for a piece of the house’s acclaimed cake, but Crane coldly ignores his hint and offers cookies instead. Catherine Hindman (EMILY BARBER) shares her secret with her sister Lesley Whyte (JORDON STEVENS). No sooner has Val rescued one woman when another appears from out of the night. Lesley Whyte, whose home birth Lucille attended earlier in this episode, brings her sister Catherine to the Nonnatus House door, in dire need of medical help. The aspiring model has been ill for days after seeing “a woman” to get rid of her pregnancy. She was told her body would expel the fetus, but it hasn’t and she’s weak and in great pain. The siblings didn’t go to the hospital, because they fear Catherine will be arrested: abortion is illegal. Not wanting to draw the visiting sergeant’s attention, Val quietly ushers the sisters to a bathroom. Sister Frances trails behind with a requested enamel bowl and briefly witnesses the scene before being sent away again. 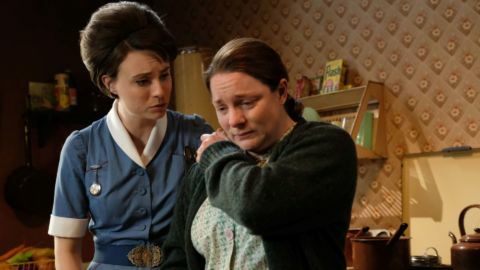 As during childbirths on Call the Midwife, this scene does not cut quickly away from pain or blood. After delivering the dead fetus, Catherine is gray and nearly unconscious. 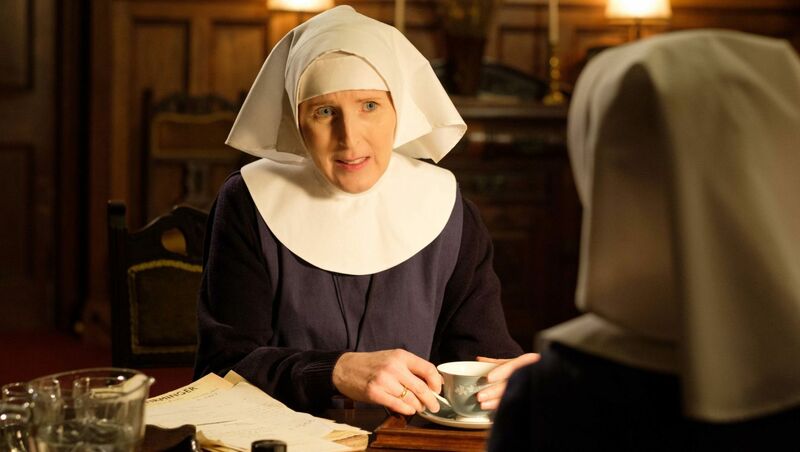 Val consults with Sister Julienne, Sister-In-Charge of the house, saying she suspects that material left inside Catherine after the abortion has led to infection. They call for an ambulance. “Did we do the right thing bringing her in?” Val asks Julienne. “The word midwife means ‘with woman.’” Sister Julienne answers. “A woman in that situation needs somebody by her side whatever mistakes or choices brought her to our door.” She leaves to accompany Catherine to hospital. “Why? … I came here to do God’s work,” Frances protests. Catherine’s womb was lacerated by instruments used in the abortion, which she did not receive at a medical facility, but in “a house.” At the hospital, she receives an operation to treat her womb and make sure no remains of the fetus are inside. “Thank you for not saying I deserved this,” Catherine says to Sister Julienne. When she awakes with her sister Lesley by her side, she learns the surgery team removed her womb. She wasn’t asked. She wanted a baby one day. Lesley asks if she’s going to report the unnamed woman who performed the abortion. Catherine won’t, but Lesley goes to the Sergeant at the Darras Street Police Station to try to open an investigation into the woman. He argues that Catherine must make a statement, or at least provide a name or location. What Are the Odds of Three? Nurse Trixie Franklin (Helen George) helps the pregnant Mrs. Lombardi (Jessica Clark). Mrs. Lombardi is pregnant with twins, and already has two sons. Her husband isn’t adept as a caretaker for children, but he is concerned about his wife, who is advised to be on bedrest at the maternity ward. As she goes into labor, Shelagh thinks she might feel three heads in Mrs. Lombardi’s womb and asks Trixie to examine her. It’s two, Trixie confirms. After delivering the first baby, Mrs. Lombardi faces a bigger challege: a breech baby (one that is positioned with its feet towards the birth canal). Though Dr. Turner is called to be present at this more difficult birth, he stands back to let Nurse Crane and the mother do their work. Mrs. Lombardi gives birth to a second girl. Nurse Crane then detects a third heartbeat. It is triplets! The mother breaks into miserable sobs at the news. The trouble now is the baby is transverse, lying side to side in the womb. Shelagh helps manipulate the baby’s position externally and leaves the room. No, it’s not a squad that will fly in via helicopter. This type of emergency team began in the early 1930s and was deployed when a situation was beyond one midwife’s assistance. Composed of an obstetrician, an anaesthetist and a midwife, the team normally would rush (ie: “fly”) to homes where there were complications in birth. Mrs. Lombardi’s labors and some forceps help deliver the child, which is silent and appears lifeless. Trixie begins massaging and rubbing the newborn while Shelagh puffs into a hose connected to a water-filled plastic device that also has a tube connecting to the infant’s mouth. The squad does arrive quickly, but Nurse Crane halts them at the door, as the birth has already occurred and she doesn’t want the mother frightened by the crowd. Trixie and Shelagh continue their efforts to revive the baby. At last the third baby cries, and so do we. Later, Trixie seeks out Mrs. Lombardi’s husband in the local pub, no small challenge as she continues her sobriety. She informs the man, bewildered by his family’s rapid growth by three, of the “poorly” baby, who could use his attention, since his wife Margaret is too weak to see her in her separate room. He leaves the many congratulatory full pints on the table before him and heads to the maternity ward. Trixie, with her tactful way of expressing things in the way they’re best heard, has helped Mr. Lombardi see that he can have a role in caring for his children, too. Sister Hilda (FENELLA WOOLGAR) and Sister Julienne (Jenny Agutter) discuss abortion. Sergeant Woolf visits Lesley and her husband at their home to try to learn how to find the woman who performed her sister’s abortion. The arrangements of making an appointment were secretive to protect the location. Lesley is adamant that it is the woman who is breaking the law, not those who visit her. Lesley visits Catherine in the hospital and is surprised to learn she is about to leave. Catherine has a hard set to her face and says she’ll restart her career plans and “go out West.” Lesley asks if she’ll talk to the police before she leaves town. No, Catherine wants it all to be in the past. But she’ll carry the shame wherever she goes. Before closing with words of philosophical wisdom from the narrator, scenes unfold to the tune of buoyant song “I Like It,” by Gerry & the Pacemakers, a number one hit from 1963. The Lombardi family pose for photos, Fred returns Sister Monica Joan’s bag to her door, and the Nonnatus family and friends celebrate the birth of Queen Elizabeth’s new baby boy, Prince Edward, born March 10, 1964. For more background on the year the midwives and sisters are living through, see our 1964 highlights of songs, films, advances in medicine and science and more. Watch the next seven Call the Midwife episodes on Sundays at 8pm. 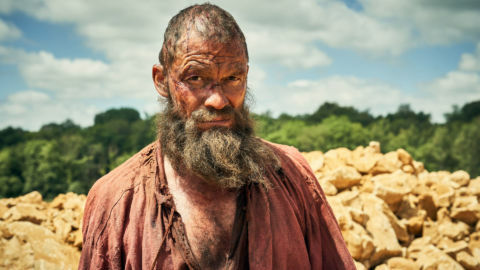 Episodes will stream for two weeks after broadcast.